[S6] G.E. Cokayne; with Vicary Gibbs, H.A. Doubleday, Geoffrey H. White, Duncan Warrand and Lord Howard de Walden, editors, The Complete Peerage of England, Scotland, Ireland, Great Britain and the United Kingdom, Extant, Extinct or Dormant, new ed., 13 volumes in 14 (1910-1959; reprint in 6 volumes, Gloucester, U.K.: Alan Sutton Publishing, 2000), volume I, page 421. Hereinafter cited as The Complete Peerage. [S6] Cokayne, and others, The Complete Peerage, volume I, page 422. [S2] Peter W. Hammond, editor, The Complete Peerage or a History of the House of Lords and All its Members From the Earliest Times, Volume XIV: Addenda & Corrigenda (Stroud, Gloucestershire, U.K.: Sutton Publishing, 1998), page 65. Hereinafter cited as The Complete Peerage, Volume XIV. [S6] G.E. Cokayne; with Vicary Gibbs, H.A. Doubleday, Geoffrey H. White, Duncan Warrand and Lord Howard de Walden, editors, The Complete Peerage of England, Scotland, Ireland, Great Britain and the United Kingdom, Extant, Extinct or Dormant, new ed., 13 volumes in 14 (1910-1959; reprint in 6 volumes, Gloucester, U.K.: Alan Sutton Publishing, 2000), volume III, page 43. Hereinafter cited as The Complete Peerage. [S15] George Edward Cokayne, editor, The Complete Baronetage, 5 volumes (no date (c. 1900); reprint, Gloucester, U.K.: Alan Sutton Publishing, 1983), volume II, page 326. Hereinafter cited as The Complete Baronetage. [S18] Matthew H.C.G., editor, Dictionary of National Biography on CD-ROM (Oxford, U.K.: Oxford University Press, 1995), Carmichael, James. Hereinafter cited as Dictionary of National Biography. [S50] John Burke, History of the Commoners of Great Britain (London, U.K.: n.pub., 1846), volume III, page 100. Hereinafter cited as Commoners of Great Britain. 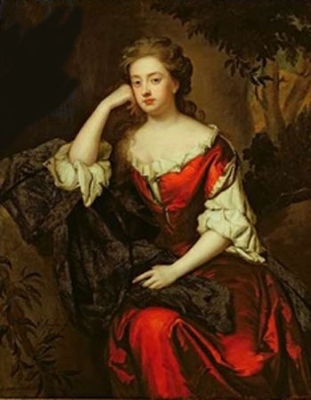 Catherine Wheatley was the daughter of Robert Wheatley.1 She married, firstly, Thomas Lucy, son of Richard Lucy and Elizabeth Urby.3 She married, secondly, George FitzRoy, 1st Duke of Northumberland, son of Charles II Stuart, King of Great Britain and Barbara Villiers, Duchess of Cleveland, before 15 March 1686. She died on 25 May 1714. Her married name became Lucy.3 From before 15 March 1686, her married name became FitzRoy. [S6] Cokayne, and others, The Complete Peerage, volume I, page 165. [S6] Cokayne, and others, The Complete Peerage, volume VI, page 336. From after 1648, her married name became Ruthven.